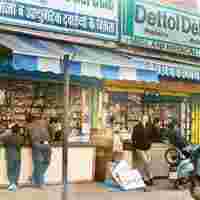 High attrition: Chemist shops in Ghaziabad, near New Delhi. Around 40,000 jobs have been lost in the pharma sector in the past five years. Mumbai: India’s Rs50,000 crore pharmaceutical industry says that the people manning its sales function are managers, not labourers, and that they do not have the rights to form a trade union or be part of one. The industry employs around five million people, of which two million are sales representatives. The Indian Drug Manufacturers’ Association (Idma), Organization of Pharmaceutical Producers of India (Oppi), and Indian Pharmaceutical Alliance (IPA) plan to ask the government to exclude sales representatives from the purview of labour laws. Industry lobbies such as the Confederation of Indian Industry and Federation of Indian Chambers of Commerce and Industry are backing the pharmaceutical associations in their bid to do this. “We are meeting labour minister Oscar Fernandes with this demand as the sales force in pharma industry cannot be treated as labourers as they are well paid and considered managerial staff," says Idma general secretary Dara Patel. “It’s part of a conspiracy and the employers wanted to have full control on employees," says Krishnakant Kadam, national secretary, Federation of Medical and Sales Representatives Associations of India (FMRAI). Kadam says the pharma industry has some very strong trade unions and the firms have been trying hard to destroy these. FMRAI is one of the strongest trade unions in the industry and represents more than 50,000 sales representatives. Ajay Piramal, chairman, Nicholas Piramal India Ltd, the country’s fourth largest drug maker with a field force of around 3,000, says that unions have lost their relevance. “Trade unionism actually eliminates freedom of companies to take the best out of an employee," he adds. The unions do not buy that argument and claim that companies have been trying to destroy them, sometimes by creating dissent within the union or propping up another one. Santosh Sawant, the general secretary of Pfizer Employees Union, claims that the “management is trying to destroy the recognized employees union by creating internal conflicts." Work at Pfizer Ltd’s Turbe plant in Maharashtra has been disrupted by clashes between employee unions last week. A Pfizer spokesperson confirmed the employees’ agitation at its production site, but denied any involvement of the management in the trade union conflict. Meanwhile, Wockhardt Ltd, another leading drug firm, has snapped relations with the medical representatives’ association, alleging that the federation was disrupting work and making unreasonable demands of the company. The severance of its relationship with the sales employees body was “part of a broader initiative to make the company more customer-centric and competitive," the firm’s chairman Habil Khorakiwala had said earlier. The union claims that Wockhardt had earlier redesignated 85% of its 1,200-strong field personnel “territory managers" in an attempt to weaken the trade union as this automatically disqualifies them from membership of the medical representatives’ association. “It also sacked some employees as they were reluctant to accept the new designation," claims a member of the union, who did not wish to be identified. Recently, the drug industry—largely represented by top pharmaceutical firms in Maharashtra—had urged the Maharashtra government to exclude medical representatives and pharmaceutical sales and promotion workers from the protection of the Maharashtra Recognition of Trade Unions and Prevention of Unfair Labour Practices Act. The ruling Congress government tabled a draft Bill in the assembly last month to introduce the exemption but could not go ahead with this because of opposition from other parties. The Bill has been put off by six months. Trade unions fear that if the Union government takes a decision to exclude the pharma sales force from the purview of the labour protection law, companies will start exploiting employees. “This is a dangerous trend," says Ramesh Sundar, a Chennai-based member of FMRAI. Estimates show that about 40,000 jobs have been lost in the pharma sector in the last five years. A recent survey by Interlink Marketing Consultancy, a pharma marketing consultancy firm, has showed that the pharma industry is grappling with a high level of attrition due to high stress at work and inadequate payment. Trade unionism in India reached its peak in the 1980s in Mumbai when thousands of textile mill workers became members of unions. In the second and concluding part of the two-part series on trade unions in India, Mint looks at the movement in the pharmaceuticals industry. Part I (on 7 August) looked at the reaction of retail firms to trade unions.